Last among matrices of स्वरसन्धि-s is Matrix 4 for the rows of ए, ऐ, ओ, औ. Although this is the order, in which one learns these vowels, for learning संधि-s, they are better put in the sequence ए, ओ and ऐ, औ. The logic is that among these four conjoint vowels, ए, ओ are of गुण-character and ऐ, औ are of वृद्धि-character. 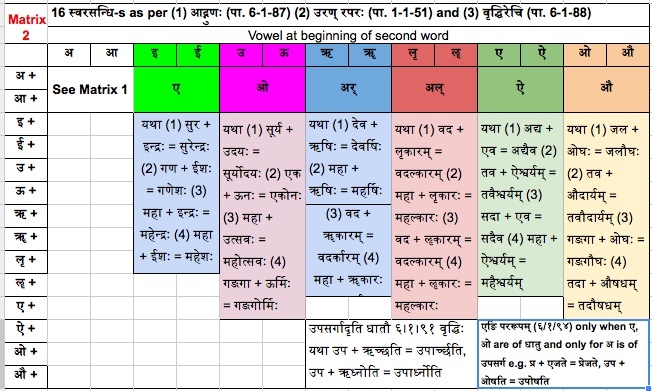 Basically we would be studying स्वरसन्धि-s, wherein we have ए, ओ and ऐ, औ in the पूर्ववर्ण-position and we may have any of the 14 vowels – अ, आ, इ, ई, उ, ऊ, ऋ, ॠ, लृ, लॄ, ए, ऐ, ओ, औ in the परवर्ण-position. So we have to study 4*14 = 56 स्वरसन्धि-s.
अय्-अव्-आय्-आवः = take अय्-अव्-आय्-आव् respectively. That is, replace ए, ओ, ऐ and औ by अय्-अव्-आय्-आव् respectively. Let us take example of ते + आगताः When doing any संधि, we should keep alphabetical analysis in mind. As is obvious, here we have त् + ए + आ (गताः). We are looking for संधि of ए + आ. As per एचोऽयवायावः we should replace ए by अय्. By that we would have त् + अय् + आ (गताः) The result then becomes तयागताः, right ? संधि-s as per this rule are also called as यान्तावान्तादेशसन्धि-s. But some other rules also apply in specific instances. To explain all these 56 स्वरसन्धि-s by examples is going to be quite some exercise. Anyway, there is no shortcut to success ! Case 1 ए + अ For example ते + अत्र By एचोऽयवायावः it should be तयत्र. But ए + अ is an exception. Here the general rule एचोऽयवायावः is superseded by एङः पदान्तादति। (६/१/१०९). संधि-s as per this rule are called as पूर्वरूपसंधि-s. 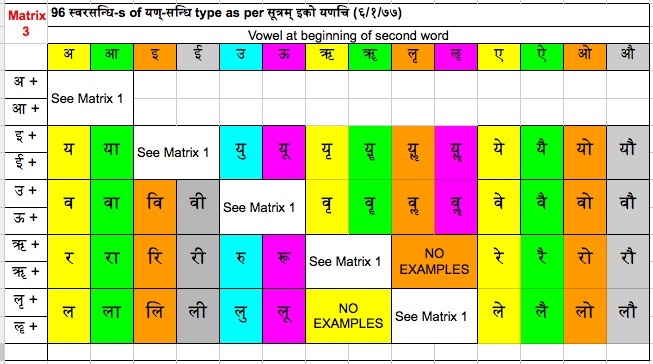 In ते + अत्र the alphabetical analysis is त् + ए + अ(त्र). Between ए + अ, ए is पूर्वरूप or पूर्ववर्ण. That stays. The पररूप or परवर्ण is अ. That vanishes or becomes invisible and is not to be pronounced. So संधि of ते + अत्र becomes तेत्र. When writing there has been a practice of giving an indication of the invisible अ by a symbol ‘s’. This symbol is called as अवग्रह. So, when one sees अवग्रह, one should read तेsत्र with a little prolongation of the ए sound, as if one is also pronouncing अ. So, the symbol ‘s’ means “prolong a little bit, the previous vowel sound”. Now there is also an OPTION for this संधि. The option is by the rule लोपः शाकल्यस्य (८।३।१९). लोपः means something gets dropped off. What drops off in this instance is य् from अय् or आय्, also व् from अव् or आव्. So, ते + आगताः ⇒ त् + अय् + आ (गताः) ⇒ त् + अ + आ (गताः) ⇒ त आगताः. It ought to be noted that having dropped य् we get त आगताः. We MUST NOT make further संधि of त आगताः as त + आगताः = तागताः. Case 3 ए + इ e.g. ते + इच्छन्ति = तयिच्छन्ति or त + इच्छन्ति. I am a fan of श्रीमद्भगवद्गीता not only because one can learn eternal and universally valid philosophy from it, but also because one can learn Sanskrit, when studying it. There is a phrase in 1’33, which is a good example of Cases 3 and 1. The phrase is त इमेऽवस्थिताः Actually most Sanskrit texts and many Sanskrit words have संधि-s already done. So, the first step in exploring the meaning of a Sanskrit text becomes to decipher or segregate the components. This is called as पदच्छेदनम्. I have already hinted that त इमेऽवस्थिताः has Cases 3 and 1 inherent. Maybe, it would be a good idea to put in such exercises on पदच्छेदनम् in the flow of this lesson. Cases 15 to 28 for ऐ + अ, ऐ + आ, …. ऐ + औ will all be by एचोऽयवायावः and optionally by लोपः शाकल्यस्य. Here are examples of not all 14 cases but of a few cases. I shall give some cases as exercises. Case 16 ऐ + आ e.g. कस्मै + आनन्दः = ? or ? Case 18 ऐ + ई e.g. कस्मै + ईशः = ? or ? Case 20 ऐ + ऊ e.g. कस्मै + ऊर्जा = ? or ? Cases 22, 23 and 24 for ऐ + ॠ, ऐ + लृ, ऐ + लॄ need not be discussed, because, in Sanskrit texts, one would not find any words starting with ॠ, लृ or लॄ. Case 25 ऐ + ए e.g. कस्मै + एजन्ति = कस्म् + ऐ + एजन्ति = कस्म् + आय् एजन्ति = कस्मायेजन्ति or कस्मा एजन्ति One good example of this case also is of how one gets चतुर्थी एकवचनम् for रै (meaning wealth). The suffix प्रत्यय for चतुर्थी एकवचनम् is ए. So we have to do रै + ए = र् + आय् + ए = राये. One comes across this word राये in the last stanza of ईशावास्योपनिषत् – अग्ने नय सुपथा राये अस्मान् (O fire ! for wealth, lead us by the righteous path). Such संधि occuring in the process of formation of a word is called as internal संधि. We must not do पदच्छेदनम् for such internal संधि-s.
Case 26 ऐ + ऐ e.g. कस्मै + ऐश्वर्यम् = ? or ? Case 28 ऐ + औ e.g. (a) रै + औ = र् + ए + औ = र् + आय् + औ = रायौ. Note, औ is suffix for formatting प्रथमा and द्वितीया द्विवचनम् of words. By रै + औ = रायौ we have रायौ as प्रथमा and द्वितीया द्विवचनम् of रै (b) कस्मै + औषधिः = ? or ? Cases 29 to 42 shall be for ओ + अ, ओ + आ, … ओ + औ. Case 29 ओ + अ This संधि is similar to that of ए + अ, that is, the rule एङः पदान्तादति। (६/१/१०९) applies. For example सो + अपि = सोऽपि. But there would be instances when only एचोऽयवायावः (६/१/७८) applies. Take for example forming a compound word to say “following a cow”. The word for cow is गो and for “following” is अन्वयः. So we have to do compounding of गो + अन्वयः. This compounding will be only by संधि as गो + अन्वयः = ग् + ओ + अन्वयः = ग् + अव् + अन्वयः = गवन्वयः We cannot do गो + अन्वयः = गोऽन्वयः. This is because the rule एङः पदान्तादति applies, only if ओ is in पदान्त i.e. at the end-position of a word. In the process of making a compound word, गो + अन्वयः the ओ of गो would not remain at the end of the word. one, who goes behind a cow, i.e. a cowherd and in a specific instance गवन्वयः means Lord Krishna ! In the lessons thus far, I have not discussed समास-s. This example is a good suggestion to discuss them soon. Cases 30 to 42 ओ + आ, ओ + इ … will be in the case of compound words, only by एचोऽयवायावः (६/१/७८) and in the case of uncompounded words by एचोऽयवायावः (६/१/७८) or optionally by लोपः शाकल्यस्य (८।३।१९). In Sanskrit there are not many words like गो, which have ending vowel ओ. So, as examples of cases 30 to 42, we can have compound words with गो as first component. 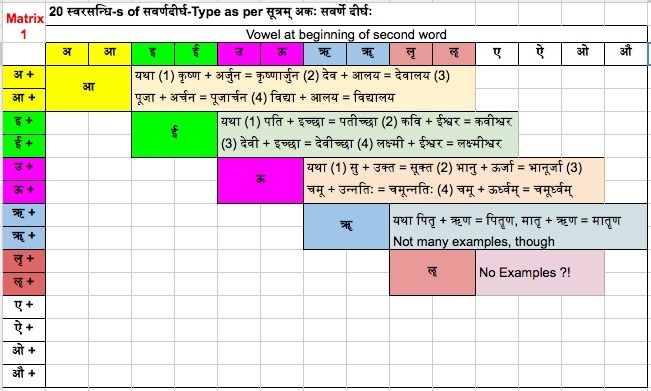 In Sanskrit सम्बोधन-एकवचनम् of उ-कारान्त masculine words would have ending vowel ओ. For example प्रभु ⇒ प्रभो, भानु ⇒ भानो, गुरु ⇒ गुरो, etc. Let us see a few examples and have some for exercise. Case 32 ओ + ई e.g. (a) गो + ईशः = ? meaning master of cow(s) i.e. a cowherd. (b) प्रभो + ईशः = ? or ? Case 34 ओ + ऊ e.g. (a) गो + ऊर्जा = गवूर्जा meaning the strength of a bull. (b) प्रभो + ऊर्जा = ? or ? Cases 36, 37 and 38 for ओ + ॠ, ओ + लृ, ओ + लॄ need not be discussed, because, in Sanskrit texts, one would not find any words starting with ॠ, लृ or लॄ. Case 40 ओ + ऐ e.g. (a) गो + ऐश्वर्यम् = गवैश्वर्यम् Some bulls have a grace, even by their horns. Grace of a bull is गवैश्वर्यम्. (b) प्रभो + ऐश्वर्यम् = ? or ? Case 42 ओ + औ e.g. (a) गो + औ = गवौ i.e. प्रथमा or द्वितीया द्विवचनम् of गो (b) प्रभो + औषधिः = ? or ? Cases 43 to 56 for औ + अ, औ + आ, …. औ + औ will all be by एचोऽयवायावः and optionally by लोपः शाकल्यस्य. Here are examples of not all 14 cases but of a few cases. We shall have some cases as exercises. Case 43 औ + अ e.g. (a) नौ + अस् = न् + औ + अस् = न् + आव् + अस् = नावस् = नावः Note, अस् is suffix for formatting प्रथमा बहुवचनम् of words. So नावः is प्रथमा बहुवचनम् of नौ. (b) तौ + अक्षरौ = तावक्षरौ or ता अक्षरौ (c) In गीता in श्लोक 2’8, there is the word भूमावसपत्नम्. What would be its पदच्छेदनम् ? Case 44 औ + आ e.g. (a) नौ + आ = न् + औ + आ = न् + आव् + आ = नावा Note, आ is suffix for formatting तृतीया एकवचनम् of words. So नावा is तृतीया एकवचनम् of नौ. (b) नौ + आसनम् = नावासनम् becomes a compound word meaning seat in a boat. (c) तौ + आगतौ (meaning, “those two have come”) = ? or ? Case 45 औ + इ e.g. (a) नौ + इ = न् + औ + इ = न् + आव् + इ = नावि Note, इ is suffix for formatting सप्तमी एकवचनम् of words. So नावि is सप्तमी एकवचनम् of नौ. (b) तौ + इच्छतः (meaning “They two wish”) = ? or ? Case 46 औ + ई e.g. (a) नौ + ईशः = नावीशः becomes a compound word meaning master, captain of a boat (b) तौ + ईशौ (meaning “those two masters”) = ? or ? Case 47 औ + उ e.g. (a) नौ + उत्सवः = नावुत्सवः becomes a compound word meaning festival of boats. There is long tradition of boat race festivals in Kerala, in Tripura, even in Laos. (b) तौ + उपविशतः (meaning “those two sit”) = ? or ? Cases 50, 51 and 52 for औ + ॠ, औ + लृ, औ + लॄ need not be discussed, because, in Sanskrit texts, one would not find any words starting with ॠ, लृ or लॄ. Case 54 औ + ऐ e.g. तौ + ऐश्वर्ये (meaning the two splendours) = ? or ? Case 55 औ + ओ e.g. (a) नौ + ओस् = न् + ओ + ओस् = न् + अव् + ओस् = नावोस् = नावोः Note, ओस् is the suffix for formatting षष्ठी or सप्तमी द्विवचनम् of words. नावोः is षष्ठी or सप्तमी द्विवचनम् of नौ (b) द्वौ + ओष्ठौ (meaning “two lips”) = ? or ? Case 56 औ + औ e.g. (a) नौ + औ = न् + औ + औ = न् + आव् + औ = नावौ Note, औ is suffix for formatting प्रथमा and द्वितीया द्विवचनम् of words. So नावौ is प्रथमा and द्वितीया द्विवचनम् of नौ. (b) तौ + औषधी (meaning the two medicines) = ? or ? Exercises – Among विभक्तिप्रत्यय-s case-suffixes following have a vowel at their beginning. Since suffixes affix after the word, in the case of the suffixes having vowels at the beginning, the vowels become परवर्ण-s. So it would become a good exercise to get शब्दरूपाणि of words रै, गो and नौ in following cases. प्रत्यय for प्रथमा and द्वितीया द्विवचनम् is औ. प्रत्यय for तृतीया एकवचनम् is आ. प्रत्यय for चतुर्थी एकवचनम् is ए. प्रत्यय for पञ्चमी and षष्ठी एकवचनम् is अस् (अः). प्रत्यय for सप्तमी एकवचनम् is इ. Some of these have been already discussed also. No harm doing them again as exercises. Hence there are (8×12 =) 96 संधि-s possible. संधि-s as per this rule are also called as यण्संधि-s. It will be appreciated that it is difficult to give examples of all 96 possible संधि-s within the matrix itself. These are compiled below. लक्ष्मी + ॠकारः = लक्ष्म्यॄकारः Some people consider that ॠ becomes आर् and not just र्. In that case the संधि becomes लक्ष्म्यार्णम्. Actually this example is concocted. Hardly any good example is found in literature. लक्ष्मी + ॡकारः = लक्ष्म्य्लृकारः Some people consider that ॡ becomes अल् and not just ल्. In that case the संधि becomes लक्ष्म्यल्णम्. Actually this example is concocted. Hardly any good example is found in literature. लक्ष्मी + ॡकारः = लक्ष्म्य्लॄकारः Some people consider that ॡ becomes आल् and not just ल्. In that case the संधि becomes लक्ष्म्याल्णम्. Actually this example is concocted. Hardly any good example is found in literature. साधु + ॠकारः = साध्वॄकारः Some people consider that ॠ becomes आर् and not just र्. In that case the संधि becomes साध्वार्कारः. Actually this example is concocted. Hardly any good example is found in literature. साधु + लृकारः = साध्वॢकारः Some people consider that ॡ becomes अल् and not just ल्. In that case the संधि becomes साध्वल्कारः. Actually this example is concocted. Hardly any good example is found in literature. साधु + ॡकारः = साध्वॣकारः Some people consider that ॡ becomes आल् and not just ल्. In that case the संधि becomes साध्वाल्कारः. Actually this example is concocted. Hardly any good example is found in literature. अमू + ऋकारौ = अम्वृकारौ Some people consider that ऋ becomes अर् and not just र्. In that case the संधि becomes अम्वर्कारौ. Actually this example is concocted. Hardly any good example is found in literature. अमू + ॠकारौ = अम्वॄकारौ Some people consider that ॠ becomes आर् and not just र्. In that case the संधि becomes अम्वार्कारौ. Actually this example is concocted. Hardly any good example is found in literature. अमू + लृकारौ = अम्वॢकारौ Some people consider that ॡ becomes अल् and not just ल्. In that case the संधि becomes अम्वल्कारः. Actually this example is concocted. Hardly any good example is found in literature. अमू + ॡकारौ = अम्वॣकारौ Some people consider that ॡ becomes आल् and not just ल्. In that case the संधि becomes अम्वाल्कारः. Actually this example is concocted. Hardly any good example is found in literature. (8) No Examples for row ॡ + because there are no words ending with ॡकार. It would have been noted that 96 possible was a theoretical calculation. Practically, I have managed to compose only 62 examples. Examples with ऋ ॠ लृ and ॡ in particular had to be ‘managed’ by concoction. Even though I have been discussing स्वरसंधि-s in previous lessons, it has always been on my mind that there should be a structured, tabulated view, sort of a Matrix view. After quite some effort and study, I am glad that I have been able to compile primarily the general rules for all the 196 possible combinations of स्वरसंधि-s in just 4 matrices. I would like to present them across three lessons matrices 1 and 2 in this lesson 21, Matrix 3 in next lesson No. 22 and Matrix 4 in lesson No. 23. Here is Matrix 1 covering स्वरसंधि-s as per सूत्रम् – अकः सवर्णे दीर्घः (6-1-101). Examples of all 20 स्वरसंधि-s are also given. – Note, just one सूत्रम् with just three words becomes the rule covering 20 स्वरसंधि-s ! That is पाणिनि !! These संधि-s are also called as सवर्णदीर्घसंधि-s. These are 5 blocks, of 4 संधि-s each, diagonally across 10 rows. To proceed further, it becomes logical to proceed by rows, firstly by the first two rows for अ + and आ +. Here is the matrix 2 for the first two rows. There are 8 संधि-s under columns for इ, ई, उ, ऊ. These are as per पाणिनिसूत्रम् आद्गुणः (6-1-87). संधि-s as per this rule are also called as गुणसंधि-s.
Next there are 8 more under columns for ऋ, ॠ, लृ, ॡ as per उरण् रपरः (1-1-51). It is interesting how a short and crisp सूत्रम् specifies the rule for so many patterns. There is a box under the columns for ऋ, ॠ, लृ and ॡ, mentioning the सूत्रम् – उपसर्गादृति धातौ (6-1-91). This सूत्रम् supersedes the सूत्रम् उरण् रपरः (1-1-51) applicable for these columns. Hence, by virtue of this superseding सूत्रम्, in the special cases of अ/आ-ending उपसर्ग-s followed by धातु-s having initial वर्ण ऋ, there is वृद्धिः आर् instead of अर्. Note संधि between उपसर्ग and धातु is compulsory. The box applies only for columns for ए and ओ, not for all the 4 columns. So, these are very special संधि-s of अ + ए and अ + ओ. It is important to bear in mind the rule, telling the instances, when it is compulsory to make a संधि. धातूपसर्गयोः = Between धातु and उपसर्ग, e.g. in अपेक्षते there is उपसर्ग अप and धातु ईक्षते These have to be said only as अपेक्षते as per the गुणसंधि of अ + ई = ए See column for ई in Matrix 2. समासे = The word धातूपसर्गयोः is a compound word having component words धातु and उपसर्ग. Because it is a compound word, there has to be संधि of उ + उ = ऊ, a सवर्णदीर्घसंधि as per अकः सवर्णे दीर्घः in Matrix 1. वाक्ये तु सा विवक्षां अपेक्षते = In a sentence it is discretionary. For example, one may say त्वं एव माता or त्वमेव माता. We shall see Matrix 3 in the next lesson. It should be appropriate at this point, to appraise of some technical aspects of the process of संधि-s.
संधि is also called as संहिता. Interestingly, in श्रीगणपत्यथर्वशीर्षम् there is a मन्त्र “संहिता सन्धिः” I am left wondering of the significance of this मन्त्र in श्रीगणपत्यथर्वशीर्षम्, because, for a student of grammar, these two words of the मन्त्र are just synonyms. But what is the spiritual significance for it to be a मन्त्र in a स्तोत्रम्, an ode to the deity गणपति / गणेश ? When the resultant sound is only a single sound, it is एकादेशः Most संधि-s result in एकादेश. But there are instances that it would not be so. The change आदेशः may happen by addition आगम omission लोप or mutation विकार. Segregating components of a coalesced word is called as पदच्छेद. It is the first step, very much essential, to be able to understand any Sanskrit text. If two elemental sounds would get coalesced in the natural process of pronouncing them, they would get so pronounced very naturally, right ? संधि is a natural process of pronouncing or speaking Sanskrit. Rather, rules of संधि are not really rules, but they are grammatical summary of, what the natural process of coalescence happens during pronunciation. Since संधि-rules are grammatical summary of, what the natural process of coalescence happens during pronunciation, all the detailing of संधि-rules, becomes a strong evidence to establish that Sanskrit has essentially been a spoken language. This evidence stands to nullify all argument about Sanskrit ever having been a spoken language. One may ask, “If पदच्छेद is the first step, so very essential, to be able to understand any Sanskrit text, why have I taken it so late in these lessons in “Simple Sanskrit” ? The answer is in the question itself ! Before indulging in पदच्छेद, one needs to know पद-s and how they are formed / obtained. It needed all those 16/17 lessons to discuss that, the पद-s. That discussion is far from complete. But I thought, it is not wiser to postpone discussing संधि-s. In treatises on grammar, especially in सिद्धान्तकौमुदी by भट्टोजी दीक्षित discussion on संधि-s starts right from chapter 2. For my lessons of “Simple Sanskrit”, I have kept the focus to be simple and step by step. Every step is not necessarily a small step. If one can compose 240 sentences from lesson 1 itself, it is not a small step. But it is not a big step either, because all those sentences are just two-word sentences. Often enthusiasm of people wanting to learn a new language is high-pitched. Some want to start conversing, right from word ‘go’. It is my firm conviction, that wrong or incorrect Sanskrit is not Sanskrit at all. I keep listening to conversational Sanskrit, only with a pinch of salt. It becomes discourteous to correct the person at every error, right ? But if errors are not corrected, whatever Sanskrit is spoken may sound Sanskrit-like, but it would not be Sanskrit. I for one would never like to be a party to promoting Sanskrit-like Sanskrit. There should be an overwhelming environment, maybe 24×7, of that language falling on your ears. Both these aspects do not apply to Sanskrit. Having had that surprise some 15 years back, it surprises me no more. I realize that my own American grandchildren speak Marathi, quite fluently, I would say. But they are struggling to read and write. That would be so, with many, many, many. many children, who can speak their mother-tongue, but cannot read, much less, write. That has now become a great anxiety weighing heavily on the minds of their parents. But why should the parents be anxious ? What is wrong with being able to only speak, but not be able to read or write ? To my mind, being able to read what is written in a language, connotes getting acquainted with the culture. Yes, every language connotes a culture. Every language has a rich cultural heritage to be carried forth. That cannot be more true for any other language, other than Sanskrit. (1) An Education In Beauty – The Sanskrit language is full of beauty: beauty of sound, of structure, of script, of poetry and of prose. Such beauty opens the heart. (3) A New View Of The World – Sanskrit literature expresses a refreshing and expansive view of human nature and its role in creation. In this era of unprecedented change and uncertainty, it can be a valuable tool to assess and look afresh at society. (4) Sanskrit literature embodies a comprehensive map of the human makeup: spiritual, emotional, mental and physical. It presents a new way of understanding our relationship to the rest of creation and lays out guidelines which, if followed, would lead to a productive and happy life. (5) A Systematic Grammar – The word ‘Sanskrit’ means ‘perfectly constructed’. Study of its grammar brings order to the mind and clarifies the thinking. Sanskrit has an ordered alphabet and grammar system which makes it easy to learn. (6) At The Root Of European Languages – Sanskrit stands at the root of many eastern and western languages, including English and most other European languages, classical or modern. Its study illuminates their grammar and etymology. Many English words can be shown to derive from forms still extant in Sanskrit. I came to dwell on all this, as sort of an introduction to the topic of संधि-s and made mention of पदच्छेद. These are important concepts to be able to read and understand Sanskrit. Everything of Sanskrit becomes an enriching experience. Even grammar, especially सूत्राणि in अष्टाध्यायी will astound you by genius of पाणिनि !! When I read and realized, that the verbal root धातु जन् has the sense of passive voice inherent to it, it came to mind, “What a philosophical thought !” Is it not a fact that we do not take birth (active voice), … we are born (passive voice !) If our being born is itself so much of a passive-voice event, how unintelligent it is to have any ego or selfishness or aspirations in any aspect or at any stage of our life !! Isn’t that some grammar and philosophy together ? In the course of understanding Sanskrit, you can expect to get such revelations ! If such revelations may even differ from conventional interpretations, DO DARE TO DIFFER ! It needs courage to be able to do that. Apart from, rather, more than courage, it needs clarity and correctness in the thought-process. As is said at St. James School’s web-page, you should expect your learning of Sanskrit to get to you that clarity and correctness in the thought-process. Only by such clarity and correctness, you will realize that you will have much better, much more self-satisfying understanding of even scriptures and all that. It is so much more satisfying to read and understand गीता by oneself than by reading commentaries. One should read and study commentaries also. But one must also get understanding by oneself. That, I think, should be the objective for learning Sanskrit – self-satisfying understanding of Sanskrit texts ! I have been composing my lessons in Simple Sanskrit to serve as a small step towards that.